One hundred and thirty eight kilometers from Kota Kinabalu, the capital of the Malaysian state of Sabah, rises the majestic Mount Kinabalu. 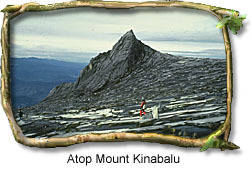 With its peak at 4,101 meters (and growing), Mount Kinabalu is the highest mountain in South-East Asia. This distinction has earned it considerable attention in myth and legend as well as in geography, and the mountain has for most of history been revered as a sacred spot. The hundreds of square kilometers encompassed by its slopes, from sea level to the jagged stone edge marking its summit, form the Kinabalu National Park. Within this area is found some of the richest flora in the world, ranging from lowland dipterocarp forest to the montane oak, rhododendron, and conifer forests of the middle altitudes and eventually to the alpine meadows and stunted, windswept bushes of the summit. The Poring Hot Springs, located nearby, are another prime attraction. The springs were developed first by the Japanese during W.W.II. Today the springs are piped into several open air, Japanese-style baths. The hot springs contain sulfur water, which has curative properties for skin diseases. Activities: Mountain climbing, photography, jungle walks. Please view our tours to Kota Kinabalu, visit the National Park, experience the native market in Tuaran (starting from USD $18 per person). All tours are offered by Viator, a preferred partner of Geographia Travel. The prime attraction here is the Hot Springs, first developed by the Japanese during World War II and now piped into several open-air Japanese style baths. For visitors with more time there are graded paths leading through rich lowland forest to mountain rivers, waterfalls and the tumbled bat caves. The park is about ninety kilometers from Kota Kinabalu. The journey takes about two hours. Mini buses depart daily from Kota Kinabalu to Ranau, from 6.00am to 3.00pm and stop at Kinabalu Park along the way.